In the past few days, synchronicity visited me twice, and both involved rediscovery. First was a forgotten old jacket of mine that caught a visiting friend’s eye. Two days later, a jacket with the exact pattern and design popped up in Roberto Cavalli’s Fall 2010 collection (picture in this article). That same week, Allen Ginsberg’s 1956 poem “Howl” drifted into my consciousness. A few days later, I discovered a movie about the poem and Ginsberg’s obscenity trial premiered (at the Sundance Film Festival). Here’s a bit of a sneak peak. Allen Ginsberg saw the best minds of his generation destroyed by madness, starving hysterical naked. So say the opening lines of “Howl”, a poem originally written as a performance piece but later published by fellow poet Lawrence Ferlinghetti. Customs officials seized 520 copies of the published poem (imported form London printers) and Ferlinghetti was tried for obscenity, based on the poem’s references to drugs and sexual practices (both heterosexual and homosexual). Nine literary figures gave testimony and Ferlinghetti won – the judge deciding the poem was of “redeeming social importance”. The poem would become something of symbol for the Beat Generation. 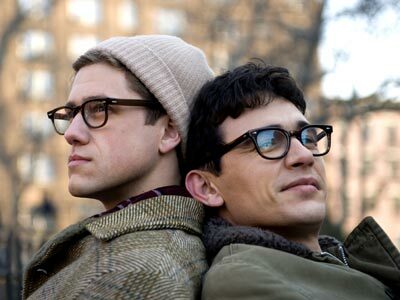 The movie is directed by Rob Epstein and Jeffrey Freedman, who directed The Celluloid Closet, a history of homosexuality on and off screen in Hollywood. James Franco (Milk) plays Ginsberg. A Who’s Who of other beatniks also appear – Jack Kerouac, Neil Cassidy and, of course, Ferlinghetti. Aside from Franco, the film also stars David Strathairn and Mary-Louise Parker from the TV series Weeds. The movie covers Ginsberg’s performance (apparently with some animation as he’s reading) and the trial. And I’m sure it will be something of a biopic on Ginsberg as well. “Victory, forget your underwear! We’re free!” Here are a few short clips.